At WWDC Apple debuted the next version of its iOS operating system, iOS 12. After dealing with issue after issue in iOS 11 for the past year, the company’s shied away from a visual overhaul, opting to fix what ails the OS and add some features that, while not revolutionary, are welcome additions to iOS 12 (and hopefully mean fewer bugs in the long run). Apple took the time to optimize for performance in iOS 12, and it shows. Older devices might benefit most from iOS 12, which is the more surprising (and appealing) part of the update. Apple Senior Vice President of Software Engineering Craig Federighi used the iPhone 6 Plus as an example of how iOS 12 improves performance on its devices. Apps launched 40 perent faster, the keyboard loads 50 percent faster, and swiping from the home screen to your camera app happens 70 percent faster. Under load, apps now launch twice as fast thanks to tweaks to how Apple’s processors handle and predict when performance is necessary. The best part? Every device running iOS 11 can run iOS 12 and benefit from the purported performance improvements. Apple’s beefing up what you can do with augmented reality, and its latest ARKit 2 update now makes augmented gaming with friends in the real world more fun for everyone. Even if you’re not playing, you can still see what’s going on through your own device. Its Shared Experiences update allow users, and even an observer with their own iOS device, to see the augmented world being shared with up to four players. Apple also announced its own AR measurement app, Measure, letting users measure things and receive accurate measurements down to the centimeter. It can also automatically detect the dimensions of objects like boxes or photos. You can now share certain augmented reality models in apps like Messages using the new usdz file format, along with Apple’s new Quick Look for AR feature. Like previewing a photo, you can preview an AR model in the real world, and project that file you just received on your coffee table to see just how big that new desk lamp is. In Photos on iOS 12, Apple is now offering search suggestions based on a variety of factors, including the faces in each image. Photos also uses a database of events, paired with your location and time data, to properly associate your pictures at the ball game with the game that took place last weekend. The “For You” tab is essentially a best of as it relates to your images. You’ll see recent events, suggestions for images and videos you should edit, and even suggestions to share your images with the people actually in the photo. Sharing with friends means Apple will also suggest they send photos they took to you, meaning you both have a full library of photos from an event. Siri got a major update in the form of both Shortcuts and Suggestions, two new features that make the voice assistant a lot more useful for handling the things you do on a daily basis (or the things you forget to do). Siri Suggestions allows the voice assistant to learn your routines, taking advantage of all the data you’ve got on your iPhone. Siri’s suggestions are location-aware, and will offer suggestions like enabling Do Not Disturb at a specific time when you have a movie ticket sitting in your Wallet app, or calling your grandmother by checking her birthday in your Contacts app. Shortcuts allow apps to provide certain cues to Siri, letting you ask Siri using “shortcuts” from other apps. Federighi’s example used the Tile app, and suggested a Siri Shortcut along the lines of “Hey Siri, I lost my keys.” It seems like a smart way to integrate third-party apps into the voice assistant as well as give Siri some new tricks based on apps you’re actually using. Google’s not the only one who wants you to spend less time on your phone. Apple’s own digital wellness service is designed to keep users aware of the time spent staring at their fancy smartphone and let focus on things that are in the real world rather than Twitter. It’s essentially a suite of improvements to Apple’s current set of time management features. For example, Apple’s added “Do Not Disturb During Bedtime” to reduce the bright glare and alerts from notifications, replacing it an all-black display paired with simple white text. In terms of notifications, Apple’s also adding a slew of notification customization options for handling large chunks of notifications based on app or topic. You can dismiss a bunch at once, perfect for clearing your screen of obligations. Siri will also suggest you disable or hide notifications from apps you seldom use. Screen Time is Apple’s way of letting you know how long you spend on your phone. You get a Weekly Activity Report to see how much time you spend in apps, how often you pick up your phone, and which apps you should probably limit. App Limits will let you set time limits on the apps that are more time sinks than time well spent (looking at you, Instagram). Of course, Apple lets you ignore the self-imposed deadlines, but the choice is ultimately up to you. The settings sync across iOS devices, so jumping from Facebook on your iPhone to your iPad means you’re still counting down the clock. Parents can get an activity report themselves to manage the time spent by their kids on iOS devices. Allowances are limits based on time or time of day, and let you ban youngsters from certain apps at all hours, or grant them access to particular apps at all times (like the Phone app, for example). Apple’s updated its Animoji avatars, adding “tongue detection” to the mix. Ever see a robot’s tongue? Yeah, it’s weird. Of course, you probably won’t use it with the stock Animoji, so Apple’s decided to go the Bitmoji route and invent its own customizable Animoji. 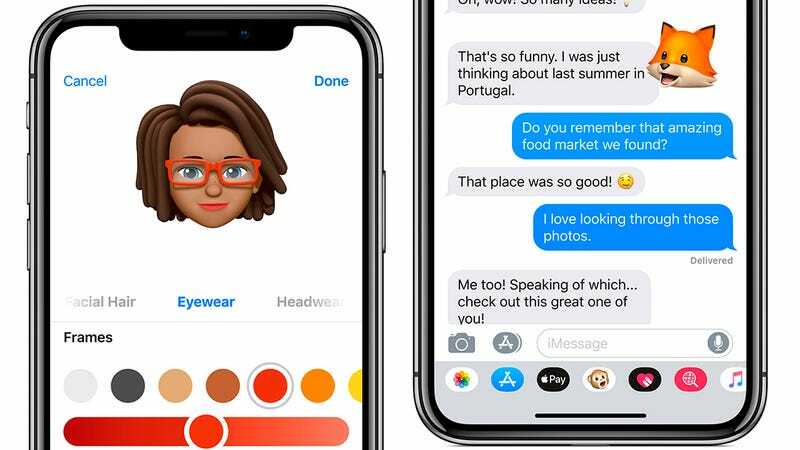 Called “Memoji,” it’s exactly what you think it is: Animoji that look like you. You can customize your Memoji to look just like you, and watch the customization happen live based on your facial expressions. Don’t want a Memoji? You can always use the new ghost, koala, tiger, and T-Rex animoji (all supporting tongue detection). Oculus Go&apos;s VR Is Good and Cheap, So Why Am I Still Disappointed?